There’s a lot to be excited about after Monday’s announcement of iOS 7. Flashy new design! Panels! Automatic app updates! Voice calls over FaceTime! Such system-wide changes aside, some of the biggest changes to iOS are found in Apple’s own mobile apps. Several of the stock Apple apps for iOS are being revamped, gaining new features and deeper integration with the Apple ecosystem. But a more full-featured mobile platform wasn’t music to everyone’s ears this week: As details of iOS 7 unfolded, the only thing some third-party app developers could hear was a sad trombone. That's because many of the features their apps provide will now be built into iOS 7 or its apps. Here are some of the apps that could be made redundant when iOS 7 arrives. 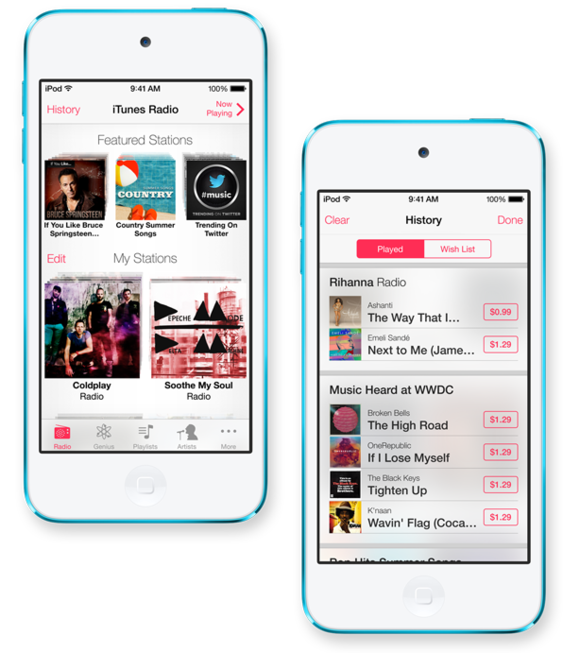 iTunes Radio is Apple’s first dive into a streaming music service for iOS. Users can listen to stations inspired by a particular track, artist, or genre, and specify songs they like and songs they never want to hear again. Apple has also created 200 featured stations, including Songs Trending on Twitter, Summer Songs, and Artists on Tour. Now there's a concept we’ve never seen before! iTunes Radio lets you stream artist or genre-based stations through the Music app. Oh, wait. Yes, we have. It’s called Pandora. iTunes Radio certainly won’t kill off Pandora, but it will offer some enticing perks to those who already use iTunes. The service will be available on mobile devices, desktops, and Apple TV. It’ll be built right into Apple’s Music app on iOS 7 and into a future version of iTunes. Every streamed song will include a purchase link, making it easy to add that track to your personal iTunes account. Plus, it’ll be a key feature of iTunes, which means it’ll be free, and Apple made no mention of a daily or monthly streaming cap. Unfortunately, iTunes Radio includes audio ads, but so does Pandora. But if you’re an iTunes Match subscriber, you'll be able to listen to iTunes Radio ad-free. iOS 7 will feature a new utility in its toolbox: A flashlight app that makes use of the iPhone’s built-in camera flash. An App Store search for flashlight yields 1273 results; that’s 1273 apps that will basically perform the same function as something that will now come standard with iOS. Most of these flashlight apps are free, but some range in price from $1 to $3. Your days are numbered, Flashlight, Flashlight+, and Flashlight!. Weather now features animations to show current conditions. Apple’s Weather app does what it’s supposed to: it tells you the current and projected weather forecast for locations around the world. But it does so without much pizzazz. Its city profiles and weather info are a little lackluster, with the daily or hourly forecast providing only basic temperatures and conditions. Other weather apps, such as the Weather Channel and Forecast.io, have long overshadowed Apple’s Weather. They have neat animations, more detailed forecast info (things like wind speed and humidity levels), and a more enticing design overall. One weather app that is sure to suffer is Yahoo Weather. Apple still pulls weather information from Yahoo, and the new Weather app's design looks oddly similar to the standalone Yahoo Weather app for iOS. (Is it any coincidence that Apple just gave that Yahoo app an Apple Design Award?) Although it still isn’t quite as detailed as other offerings, Apple’s built-in app should provide users with a better weather experience than before. Add filters straight from Camera. Even though Instagram is the undisputed king of filters, the App Store still has plenty of other photo apps designed to provide these retro special effects. They're probably most attractive to users who want the fun filters, but don’t want to play by Facebook’s rules and iffy privacy standards. But with iOS 7, iPhoneographers won’t need to rely on another camera app just for filters, because Apple’s Camera will include a pack of built-in filters that can be applied to your photos. You can choose a filter before or after a photo is taken, and if you don’t like the outcome, you can remove the filter or try a different one. Camera even includes a square-shaped shooting format, which eliminates the need to manually crop a photo in Instagram if you do want to share it there later. The new version of Camera will come with only nine filters to start—a modest collection when compared to those dedicated utilities—but they can be used with Camera’s other settings and shooting styles. Photo enthusiasts will want to hold on to more professional photo apps, such as Camera+ or Camera Awesome, which include a bevy of camera settings and shooting modes that Camera doesn’t offer. However, casual photographers will likely find Camera to be a joy to use. Lesser-known filter apps, such as Pixlr-o-matic, Camera Bag, and PhotoToaster, face some tough times ahead. OS X Mavericks, the next installment of Apple's non-mobile operating system, will include a new feature called iCloud Keychain, Apple’s solution to multiple password management. iCloud Keychain will remember website logins, credit card information (but not your security code), and Wi-Fi logins, and will integrate with Safari on your Mac. Safari will remember your password for you, or autosuggest a new password, and then sync it to your unique Keychain. iCloud Keychain syncs all of this information across all of your devices—including those running iOS—encrypted and securely. Until now, Mac users have largely had to rely on password managers—like 1Password—to store and sync our passwords, but now we'll have an alternative that doesn't cost anything extra. (1Password, on the other hand, costs $50 for a single Mac license and $18 for iOS.) Though third-party password managers offer additional features—they work with multiple browsers, for example, and provide different ways to create secure passwords—many standard Mac and iOS users will probably find that iCloud Keychain suits their needs just fine. Users who already have these third-party apps installed might be inclined to keep them around, but also might find that they don't use those apps as often once iOS 7 comes along. My guess is that these types of apps will see fewer App Store downloads after the launch of iOS 7 later this year—if their developers stand still and make no dramatic changes to their apps. But by the same token, these new standard Apple features could also inspire those same third-party developers to innovate and make their existing apps better to remain competitive. Editor's note: Updated on June 12 10:30 a.m. PT to add correct price information for 1Password. Prices listed above reflect the full price, but 1Password is currently being sold at a 50 percent discount.